Sicily is the largest of the Mediterranean islands. It is a mysterious land, spectacularly beautiful in its majestic mountains and its silvery beaches, its Greek temples and Baroque churches. It is here in Sicily that the origins of European cooking lie. The island has been dominated by Greeks, Phoenicians, Romans, Arabs, Normans, French and Spaniards, from whom, in different measures, the Sicilians acquired new learning and skills, often adapting and improving them. 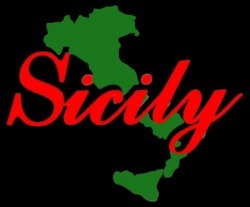 This checkered history is clearly reflected in Sicilian cooking. Sicilian cooking is undeniably the most complex and colorful in Italy. Like hues on a painter’s palette, the dishes on a Sicilian table represent the various cuisines of the many civilizations that passed through the island. The longtime isolation of the island and the Sicilians’ innate attachment to tradition have allowed for the preservation and evolution of an elaborate cuisine. In Sicily, new and old, East and West, thrive side by side, blending uniquely together as in no other place in the world.